If you’re anything like me, Bacon and bananas are two big staples when it comes to cooking up a delicious breakfast. Of course, they are both great foods on their own, but why not mix them together for something a little more adventurous? 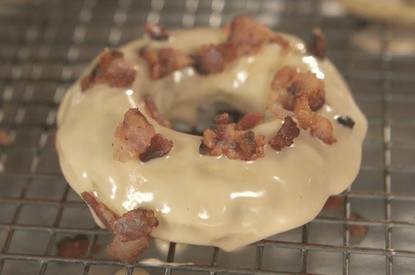 The geniuses over at Tastemade decided to kick things up a notch by creating a killer recipe for banana maple Bacon donuts. Yes, you read that right. Why not add a little sweetness to the tangy fruit and crispy, smokey flavor of the Bacon? It may sound a little like flavor overload, but I promise that each taste is perfectly balanced to create a treat that will keep you coming back for more.